In addition to being selected for the IWP program, Abdelnaby has won several other accolades and awards. He was on the longlist for the 2013 International Prize for Arabic Fiction (IPAF) for his Return of the Sheikh and also took the 2010 Sawiris award for his short-story collection Anton Chekhov’s Ghost. He is also an acclaimed translator, having recently brought Hisham Matar’s Anatomy of a Disappearance into Arabic. 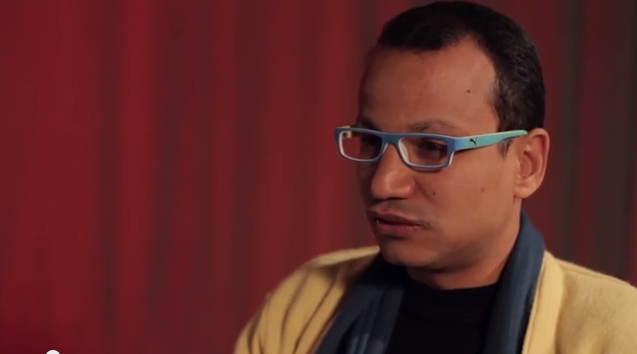 On the Map: What are the best and worst things about being a writer in Egypt? Muhammad Abdelnaby: The city is full of problems — small ones, big ones, clear and hidden, and you can’t run out of ideas [for] novels and stories. Every day you find new ideas for new things that nobody wrote about it before you. The worst thing is that nobody cares about writing — almost nobody cares. You are all alone from the beginning, from the first day as a writer, you have no institution to support you. … A few years now, we have some workshops to learn how to write. But before this, there were no workshops like this in Egypt. Young writers, they are lost, they don’t know where to go or who to talk with. If you don’t have a small group of friends who [are] writing and share your same passion, you are lost. OTM: Why do you write? MA: I don’t know, and I don’t want to know why I’m writing. The writing is not a question, it’s the answer. I don’t think happy people are asking themselves, “Why I am living?” It’s the unhappy people who ask this question. Sometimes, I feel like we are all lonely — very lonely creatures, as human beings. And writing can sometimes be the solution [to] this loneliness. Or it gives our loneliness body and story and concrete things. It makes our loneliness like [a] beautiful thing. OTM: What writer or book has been especially important for you? MA: I would like to say Naguib Mahfouz, Cairo Trilogy, but, I will not say Naguib Mahfouz because you know him well, and his works. I will recommend Edwar al-Kharrat’s novel Rama and the Dragon. Edwar al-Kharrat is a poet of the modern novel in Egypt and he didn’t receive the appreciation and the reading he really deserves. So I think he is a very important novelist and you can find his novel, Rama and the Dragon, in English, [in] a good translation by Dr. Ferial Ghazoul. OTM: Do you read poetry at all? MA: I have many poet-friends, so I read poetry, especially the prose poetry, it’s very strong now in Egypt and the Arab world. And at the same time I love very old traditional Arabic poems because you can always find little gems and beautiful things in this old traditional Arabic poetry. And I like the…Sufi poems, like Rumi and Hafez Shirazi and of course Tagore also. OTM: Should the state give financial support to writers, or to literature? MA: I don’t know. Yes, I think in every state, every country needs to pay more attention to literature, to arts in general. How it could be, I don’t know, I’m not sure. There are grants in Egypt, And the ministry of culture gives some artists and writers grants for one year or two years or something like this, but it’s like just…a drop of water in the desert. So we need more attention, we need more financial support. Maybe they can support the good, independent publishing houses. Maybe they could pay for the publishing houes and the writer to circulate more books in the schools and in the university, maybe. There are ways, but they need intention to do it. OTM: What’s a question you’ve always wanted to be asked about your work? MA: There is no specific question, but I always like to talk about my language, and how it changed from very respectful and traditional language, like Quranic language, when I was a little bit younger, because I have religious education, and I have to recite the Quran and memorize it, so my language has passed many phases. And now I would like to write simple language. Concrete. Not metaphoric. OTM: Any final words or thoughts? MA: Writing life is a very lonely life, and it’s always a pleasure to break this closed circle and to let the writers talk to each other. So it’s a pleasure to be here in the IWP and it’s a pleasure to be here with you know. For writers interested in the IWP, they are now accepting applications: For a free online creative-nonfiction class. Applications accepted from authors around the world, only 15 accepted.